If you know me at all, you know that I am a fan of phonics! A year ago, I began the hunt for the phonics curriculum for Lextin Academy. Through an email from The Old Schoolhouse Magazine, I found the Phonics Road to Spelling and Reading. Love it! Both the magazine and the curriculum. The program uses the Spalding Method or the Orton-Gillingham Method. The author was taught under Ms. Spalding and utilizes many of her phonograms and practices. The author, Barbara Beers, asserts that great spellers are always great readers, but rarely are great readers also great spellers. She focuses her program on spelling rules and grammar rules, focusing on learning phonograms and their sounds in order to decode words. Once you know why and how a word is spelled, you can read and understand the word. The program begins with learning the first set of phonograms and focusing on handwriting and correct letter formation. Ms. Beers uses the clock to help students visualize where each letter should begin and end. After learning the first set of phonograms and mastering the handwriting of lower case letters, the program moves into weekly spelling lists with corresponding spelling rules. The spelling rules are set to familiar songs and are called rule tunes. Once you have learned the first segment of spelling words, the student is to begin using their readers which are contained in the student notebook. The readers utilize words that correspond to the phonograms and spelling words already learned. The program comes with a teacher notebook with DVD’s to help you in learning and teaching the phonograms and the spelling rules. Yes, it does take some time to watch the DVD’s to prepare for each lesson but it is so worth it for me. Some parents might even want their children to watch the lessons. 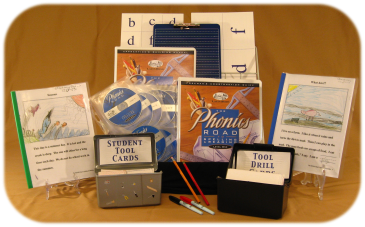 Barbara Beers teaches each lesson to you, articulating the pronunciation of each phonogram, describing the spelling and grammar rules, and demonstrating proper letter formation. The teacher notebook contains weekly lesson plans. This is for the first four weeks, which we covered in 6 months. There is a lot of information here! Once you learn the basic phonograms, you progress to the spelling word portion and the weekly lesson plans look like this. Student’s copy each spelling word onto a blank page in the student notebook which is a blank version of the teacher manual. The teacher notebook contains all the rules tunes of the spelling and grammar rules learned throughout the year. The student begins the first week with practicing handwriting skills in their notebook. Then the student progresses to keeping a record of each spelling rule learned. The student notebook is divided into sections. One being for original compositions, one for the spelling word lists, another for the record of rules, and the last section for readers. The readers are unique in that they do not contain any pictures. I have quickly learned that pictures are distracting and that Curly tries to guess words based on pictures without even attempting to sound out the word. The program allows the student to illustrate their own readers after first reading the story. We have yet to begin the spelling portion of the program, but the handwriting and phonograms have been a success. Here is proof of Curly’s improvement! This program was such a great find! We will continue on with the spelling rules and then with the readers in the fall. Next year, I hope to venture into the next level which includes more grammar and a literature study based on Little House books. This is a complete language arts program with phonics, grammar, spelling, composition, reading, and literature studies. And in later grades, it bridges you into an indepth study of Latin.